Almost all Indian currency notes are the same width, making it a nightmare for visually impaired to differentiate between them. Each note is supposed to have a marking that denotes the specific denomination for the visually impaired. However, these markings tend to fade out over time due to wear and tear, making it an inefficient method of by which identify the notes. How can we make Tiffy’s life easier? For the many visually impaired, worries about being cheated of their money due to their disability is not just worrying, it’s also frustrating. Paul, a friend of Tiffy’s, who tinkered with inventions, came up with an idea. What if there was a cheap way to discern the difference between currency notes? A solution that used lengths and widths to distinguish a difference? This solution is made up of a simple piece of PVC. The structure of this board allows the user to measure the currency notes accurately based on length, width and Braille markings. It helps Tiffy tell notes apart and only costs two rupees. Over 15 million people in India are visually impaired and they are all open to exploitation. The Tiffy Template will solve this problem once and for all. Making this will cost only two rupees each to make. That’s it. Two rupees. But we need your help to generate Rs 4,00,000 so we can make and distribute 2,00,000 of these, across India free of cost. 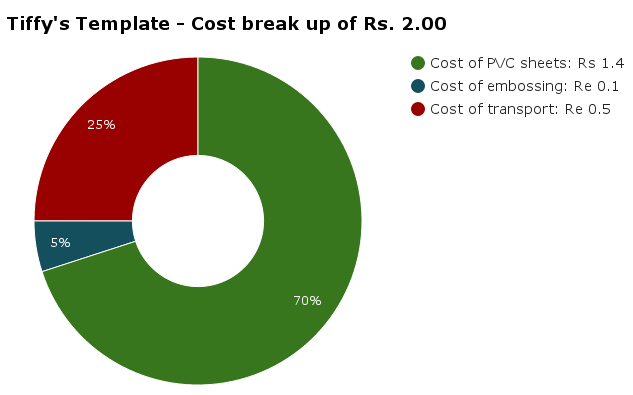 Any additional amount over the 4 lakhs will go towards producing more templates for free distribution. A small contribution from you today, can change someone&apos;s everyday life for the better! We already have requests from various institutions. We are just waiting to be able to produce and distribute them to these organisations. We have more requests on the way. There is huge demand for this template and we do not anticipate any issues with distributing or producing the same . 1. Who will instruct the organizations wrt teaching the blind on how to use the TIFFY TEMPLATE ? A)There will be a video on our portal displaying how this can be used. We will also be able to tell people at the institutes how this works on the phone or through a Skype call .They will in turn educate the blind.The template also has braille markings making it self explanatory. It is very very simple to use and any explanation does not take more than 3-5 mins. 2. How much time will you take to produce these templates ? A) We can supply them in about 30-45 days after the campaign ends and we have received the funds. 3. What is the expiry date of this template for the user? A) There is no expiry date. they can be used for as long as they last or if the currency note shapes /sizes are changed. We regularly receive warm letters requesting and acknowledging the templates we send out. I am publishing one such letter from a lady from Mumbai. It is so encouraging to have so many other centered people who get in touch with us! First of all, I would really like to appreciate you for your efforts on a great invention - Tiffy template which is very helpful to so many. Applaud! To give some context - My name is Radhika. I have an upcoming occasion in the next week and on that day, I would like to do something for others. I am planning to make a donation along with some useful gifts for kids at a blind school in Mumbai. I came across your invention while searching for the gift ideas and was moved and decided to have this arranged for all 180 girls in this school. I wanted to check with you, whether this template has been modified based on the new notes (500 and 2000 Indian rupees) available in the Indian market post demonetisation - Dec&apos;16? Also, if this can be arranged for these kids - Quantity 200 templates - by the end of this week? It will be a great help. I am happy to pay for them. Our Reply: Dear Radhika,Thanks for the enquiry. Yes, we will surely be able to ship you Tiffy Templates! Our only doubt is whether they will reach you at short notice. I will try. We have to make a new batch. Please mail me your address and I will send them to you. They are absolutely free and meant for free distribution. We are more than happy that you are making the effort and would be very willing to help you in any way possible. (11Feb2017 -it reached in time!) And Finally: Hi Paul, I have received the parcel. I am short of words to thank you enough. Appreciate all help your here. Today, 12Feb2017, The Divya Hastha Charitible Trust, Whitefield celebrated Louis Braille Day and World Disability Day on a suitable day! There was a large group blind students, well wishers and friends. Mr and Mrs Richard taught at the blind school in Whitefield for over 25 years. Mr Satish Pillai (ex Tata Steel), an athlete now working with disability sports addressed the audience. Seated (left of the banner is Mr V B Richard, founder of the Divya Hastha Charitible Trust. To the right is John Zachariah (consultant Unilever, Cap Gemini etc. etc..! ), founder trustee of The Masters Touch Trust. Mr. V B Richard and his wife Vinodha are both blind and are activey involved in helping with the Braille Display testing. We also distributed Tiffy Templates at the function and many asked for extras to give their friends! Mr John Zachariah and Mr V V Richard. Vinodha Richard in blue Sari behind the girl in the front row. One of the recipients of the Tiffy Templates proudly leaves with a batch for him and his friends. Mr Ratnakar from Hyderabad sent us some pictures of a campaign to distribute Tiffy Templates at the government home for the blind , Salar Jung colony. 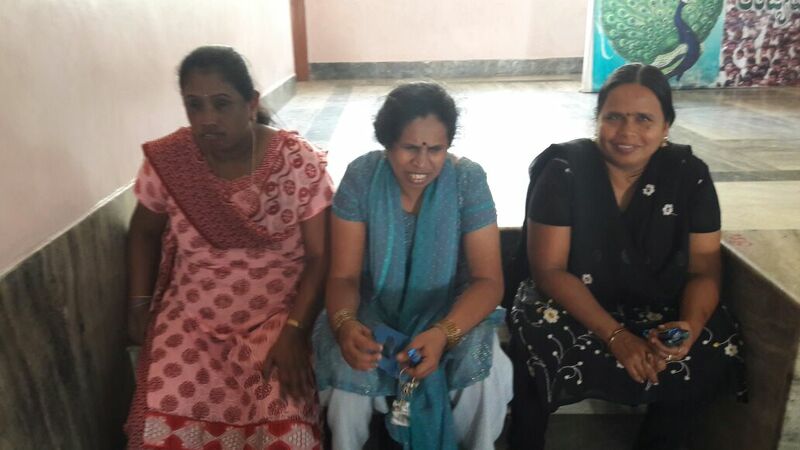 Our friends Latha, Pushpa , Chandana and Harsha went to JSB Free Residential School for the Blind, Ramanagaram, Near Janapadaloka, Bangalore. Tiffy Templates’’ were distributed to staff and students and the ladies had some fun too! The lady in the middle is a teacher from the school -very proudly holding some templates in her hand! Latha, extreme left, Chandana(red Tee shirt) and Pushpa(brown sari) with students and staff from the residential school. 7 Last year ended with a request from Hydersbad from Mr. Ratnakumar who has been very active in distribution of the "Tiffy templates &apos;&apos; . And 2017 began with a request from Andhra! A lot of activity in that part of our country! Every now and then we get a note from someone who is excited about what they are doing and who gives us an opportunity to be a part of their efforts. The &apos;Tiffy template&apos; has been the catalyst in bringing so many of us together. One request that we received yesterday came from a lady from Narsapur in the West Godavari district of Andhra. I am reproducing her message below. Its these little notes that tell us just how many wonderful people exist who have time for those who are in need of a little assistance. Its these contacts that have helped build up a network of volunteers/helpers who are taking these templates to the needy. Keep up the good work Jaya Deepika! 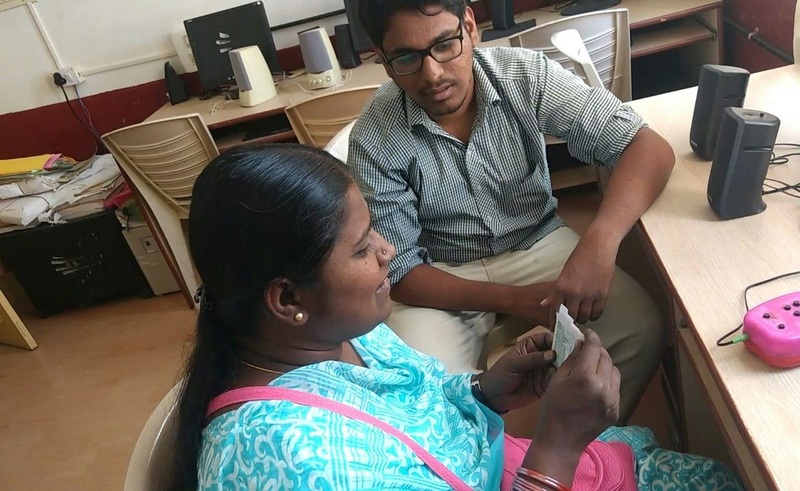 Hi Paul, I read about your Tiffy template which is useful for currency identification.In our town approximately 50 students are studying in blind school.would you help us to give them Tiffy. We also post updates on Facebook! My friend Tom Tillo raised an important point. Would &apos;the &apos;Tiffy Template&apos; be affected by the changes made to our currency? That raised an important issue as we had just begun to send out Templates in bulk. Some quick analysis of the new currency notes revealed that the template can still be used without any changes. We sent out a list of changes to all who had requested templates and instructions on how to adapt to the new currency. In a nutshell, the new 2000 ( with tactile markings) measures up to the old 500., and the new 500 is the same as the existing 20. Tactile markings on the new 500 distinguish it from the 20! Now we need to wait for a new 1000 to be introduced! 1) The new Rs2000/- note is almost identical in size to the old Rs500/- notes and has tactile markings along its shorter edges. The old Rs500/- notes minted in the last 2 years were issued with tactile markings. There might be some unscrupulous people who might try and pass off these Rs 500/- notes as Rs2000/- to our visually impaired friends. Reasons might be given like "Don&apos;t carry so many notes ..Here I will give you one Rs2000/- rupee note that you can keep safe. " . "Feel the markings, ..its genuine" ..etc. Please avoid accepting even the new Rs2000/- notes for a few months tilll all the old notes are pulled out of circulation. 2)The new Rs500/- note is the same size as our existing Rs20/- note but has tactile markings along on the shorter edges. The only word of caution is that you need to be sure that you are not being given a Rs20/- instead of a Rs500/- note. If you need to accept Rs500 notes, please try and ensure that you are familiar with the tactile markings before accepting these notes. You also need to be careful about giving a new Rs500/- instead of a Rs20/- to some unscrupulous person. We would advise NOT to use or accept the newly minted Rs500/- and Rs2000/- notes until a safe period of a few months has passed to ensure that the old currency can be completely withdrawn. The use of the &apos;Tiffy template&apos; remains un-changed for denominations up to Rs100/- and the altered usage is as explained in our earlier note reproduced below. the government of India has of 8 Nov 2016 withdrawn the current notes of Rs500/- and Rs1000/- denominations. New currency notes of Rs500/- and Rs2000/- are expected to be released shortly. We imagine that there might be concerns about the &apos;Tiffy Template&apos; and how these changes will affect its usage. A small explanation will hopefully help clarify these issues. 1)The Template can be used as normal for denominations 5, 10, 20, 50 and 100 as before, and also for the new as explained below. 2) the new Rs2000/- note will be almost identical to the old Rs 500/- note -just very slightly narrower. The length is important. It must cover the template to the top step. It also has tactile features that can be felt the two edges near the step. The new Rs2000/- has tactile features that can be felt near the shorter edges. 3)The new Rs500/- note is where confusion is likely to occur, as it is expected to be identical in size to the current Rs20/- .The new Rs500 has tactile feature at the two shorter edges. So what measures up to 20 but has ridges or lines that can be felt is a new Rs500/- note. If there are no tactile features, it is a Rs20/- note. step 4 2000 ( with tactile markings) . We would advise you to use extra care initially when trying to identify the new Rs500/- and Rs2000/- rupee denominations and take the advice of a trusted friend. It would be preferable not to transact with denominations above Rs100/-, until familiar with the new currency when it becomes available. Please do not hesitate to write to us for further clarifications or explanations. Our most regular requests for &apos;Tiffy Templates comes from a gentleman in Hyderabad - Mr. Ratnakar. He has been faithful in lodging requests via email and then giving us acknowledgements and reports of how he distributes the templates. He has a &apos;Tiffy Template&apos; group and is gathering contact details and phone numbers of all recepients and interested persons. His most recent mail from a few hours ago is reproduced here with pictures attached. I have copied Mr Ratnakar&apos;s post and description exactly as sent to us! It just goes to show how one man who has decided to devote his retirement years can do so much. We admire his spirit and dedication. Tiffy herself put Mr. Ratnakar in touch with me and I have been Madam Paul D garu ever since!!! I think he assumes I am Tiffy&apos;s sister!!..... and he is partially correct. !!! I&apos;m her brother! 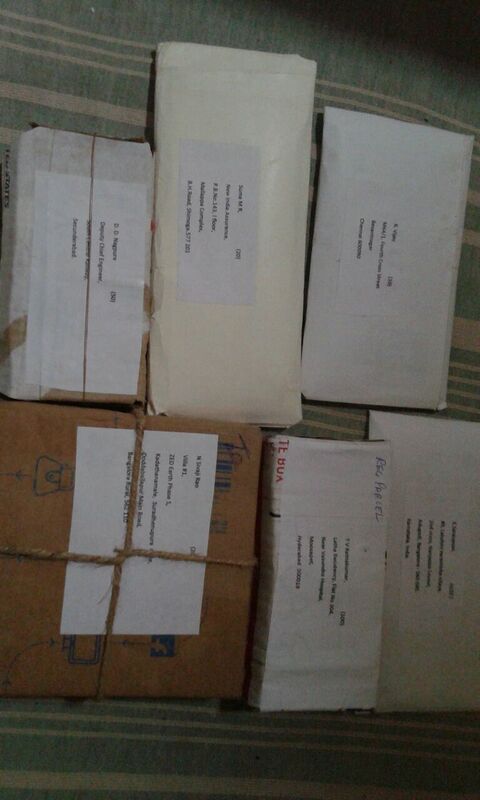 Had a call from Mr Shiva Prasad today who wanted to express his happiness that one of his contacts (Nivedita Venkatesh who works for an NGO called Youth for Seva) received the batches of templates that they had asked for. He informed me that some had even reached Bagalkot! Mr Shiva Prasad first contacted me on Jul 8th, and waited patiently until we started production. Some more encouraging positive feedback from Srinivasan P. S. from Vellore district. I am pasting his letter below. i have started using the template. its wonderful! i always consider any device that reduces our dependence as a boon. it is very easy to learn and convenient to use. identifying currency has always proved to be a challenge and there is light at the end of the tunnel. may the divine grace continue to be showered upon you as you progress in your efforts to help the blind through your inventions. i assure you that i shall see to it that the templates reach the deserving hands. I have a friend working in Hyderabad who got details about our trust work from Tiffy herself. But he insists on calling me Paul D Madam garu! I have actually spoken to him on the phone but I am convinced he thinks I am madam garu&apos;s PA! So be it. Mr Ratnakumar is working with visually impaired people and he will be receiving another batch of 200 templates this coming week. That will take his reach to 500 templates distributed amongst his associates and contacts. But that is small considering we have close to 150, 000 blind in Bangalore alone by some estimates,. 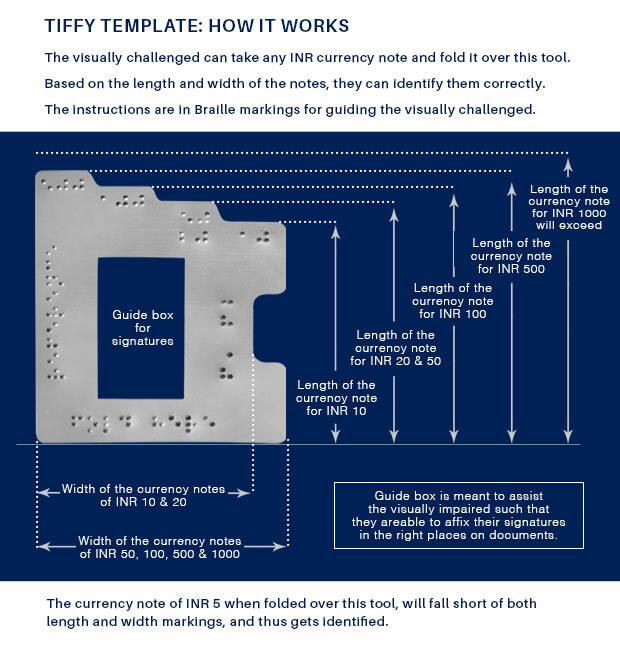 I am curious to know where you heard about the Tiffy Template INr currency identifier and how you got our contact details! I am not aware of any publicity in your part of TN. Remember to write to tmttblr@ Gmail.com for all trust related activities. you are indeed justified in seeking to know about the source of information about tiffy templates. i subscribe to 3 national -level braille magazines in English. one of them is Braille Digest-a bi-monthly magazine. the latest issue of the magazine carried an article about your invention and about Master&apos;s Touch Trust. but your mail-id has been erroneously printed. so i had a tough time trying to contact you. but i think it is the grace of God that enabled me to get your mail-id. i would request you to disseminate information about your work by reporting to braille magazines being published in various languages in india. you may also pass on such information to mailing groups of and for the blind. i am a member of Inaiyathendral-a tamil mailing group and BSFTB-an English mailing group. i shall be obliged to answer any query you have in this regard. To date we have sent out around 2000 Tiffy Templates. Most requests have been between 50 and 100. Larger requests have come from social workers, volunteers and organisations. If you know any blind persons who would benefit from having these templates, please lodge a request with your name and address and the quantity requested at tmttblr@gmail.com These templates are for free distrubition. The stamping of these templates is done on a manual press and we can make around 500pcs a day. 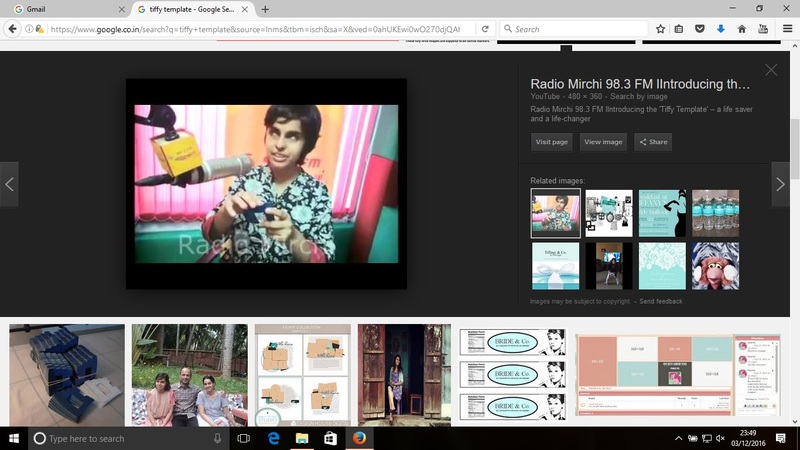 This is a link to a video interview of Tiffany Brar and some friends talking about the Tiffy Template. Managing Trustee-Mitra Jyothi. I had some unusual feedback from both! Ms. Singhal preferred the thin narrow signature window and those from Samarthanam liked the larger window! Ms. Singhal even asked if I had consulted any blind person before making the signature window! I did...and strangely, Tiffy , who was the inspiration for this has been blind from birth! It then occurred to me that those who have been trained to sign with the narrow slot find the change difficult. Those who like to sign large - especially the late blind prefer the bigger window! In the final analysis I decided to retain the larger signature window as the majority preferred it. Since the signature window was just an addition to the main feature of currency identification, it is a point of personal preferance to use it or not! Another interesting development was that I had a letter from a person in Delhi who has a design patent on something similar! I initially considered withdrawing the template and asking FAD to re-imburse all the donors! I then discovered that that the design patent was taken out in early 2015, and I had designed and had been freely distributing these templates since 2013 - the year Tiffy was doing her leadership training course at Kanthari! Since the Tiffy template was in existence and in the public domain since 2013 - I had nothing to worry about! So I wrote and informed the other gentleman of these facts and also that our desire to help the visually impaired are not at cross purposes! A set of packages of Tiffy Template requests being dispatched! We are really delighted with the response to this campaign and also to the follow up that has happened post campaign! A lot of this has taken place by word of mouth and we are grateful to everyone who is creating and spreading this awareness! 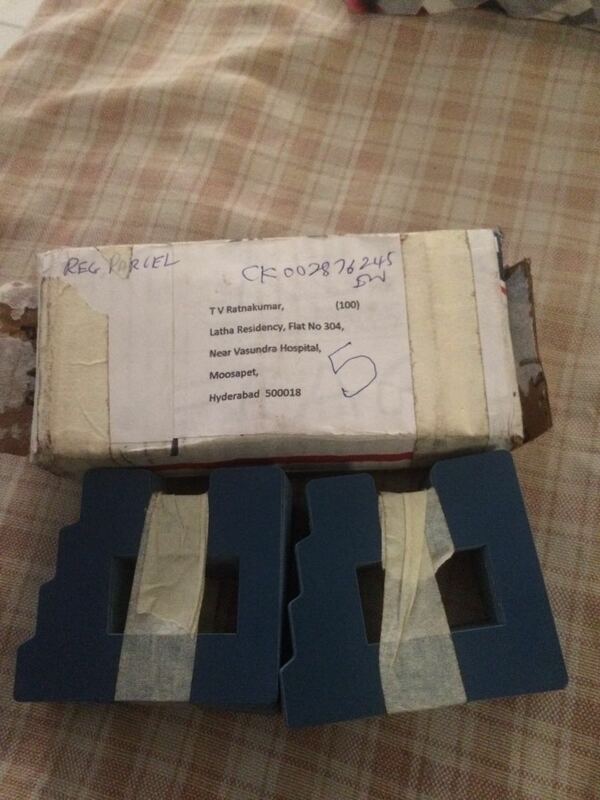 At the time of this post I received an acknowledgement of receipt of one ofe these parcels that was sent to Hyderabad! (second pic). India post can be quick! Yesterday I handed over a batch of 150 Tiffy Templates to be given to Tiffany Brar in Trivandrum! Tiffany Brar was the inspiration behind this device and it is fitting that she gets the templates from the first mass production test run! There have been a few test samples that were distributed to persons who made small requests .... but this is the first bulk shipment! &apos;&apos;Tiffy Templates&apos;&apos; to individuals who lodged requests via email at tmttblr@gmail.com. These were the test samples made from our new punching tool. 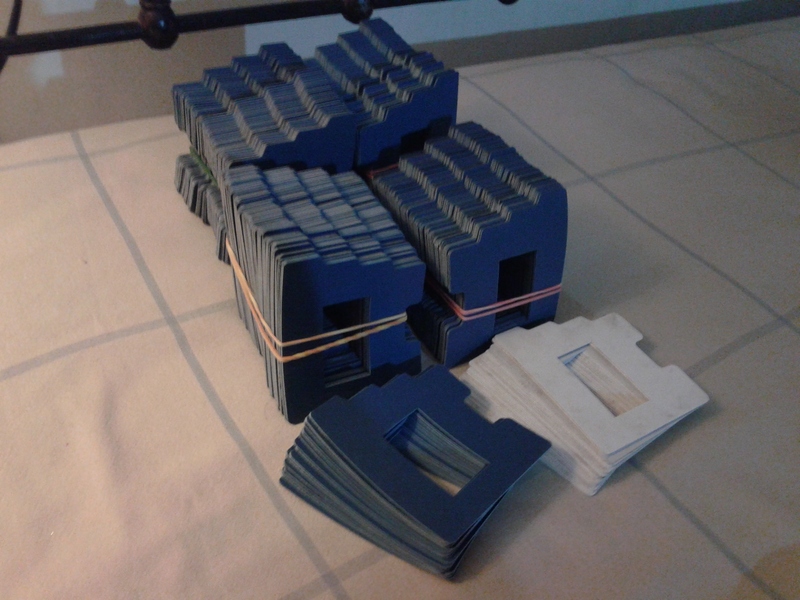 At the end of the campaign, we will mass produce Templates and start shipping and distributing them to those who have made bulk requests! Please inform any friends or organisations working with the blind to lodge requests via email giving us their contact details and quantity of templates required. Thank you - everyone of you who have encouraged us along the way! This morning I had a call from a friend who has chosen to remain anonymous. She donated the last major chunk and along with two other decent souls - we crossed our target! This campaign was designed to make a simple product available to our blind friends. In reality, it has gone a long way to help restore our faith in humanity! Thank you - every one of you for sharing our dream and helping to make it a reality. Unfortunately, we will never be able to measure the impact each contribution will make on every blind friend who receives a &apos;Tiffy Template&apos; ...but in the words of Bessie Anderson Stanley " ...............To know even one life has breathed easier because you have lived. This is to have succeeded " ..
We have finished making the stamping tool to punch out the &apos;&apos;Tiffy templates&apos;&apos; There are some minor enhancements that need to be made to make it easy on the operator....The tool is about 25kgs!! The embossing tool to add Braille markings is being completed at the moment. We have been overwhelmed by the generosity and spontaneity of the supporters of this campaign! Another anonymous donor has contributed a lakh! We have almost reached our target amount for our campaign! Thank you so much - every one of our donors and well wishers. Thank you again and again for your generosity! Hours after the last update there has been a fresh round of donations that have surpassed all our expectations! We are overwhelmed with the response and generosity of every one of our donors. I am overwhelmed with the spontaneous and generous response of so many people! It&apos;s only been a week and we&apos;re already at 35% funding! Thank you all for your warmth and support! Happy to share Tiffy Template article in Bangalore citizen matters.in. Please do click on the link below to read. CONGRATULATIONS TO GENIUS PAUL AND HIS TEAM WHO HAVE HELPED MAKE HIS DREAM A REALITY. HOPING SIMILAR FUNDING WOULD HELP TOUCHE TAKE OFF. GREAT GOING, KEEP IT UP!!! Very Inspired by this campaign! Keep up the good work. This is a very clever , original & practical device .The sheer simplicity of the tool is ingenious . Paul its been a pleasure to get to know you & learn about the amazing work you are doing for the visually impaired . Thank you. You will get a shoutout on FB. Paul D'Souza the inventor will send you a personalised email thanking you for your contribution. Paul D'Souza will call you to personally thank you for your generosity and share how he created the Tiffy template. We are floored with your generosity. Many, many, many Thanks. Your contribution has made a big difference. Paul will call you and if you can make it to Bangalore, he would love to host a lunch meeting with you.